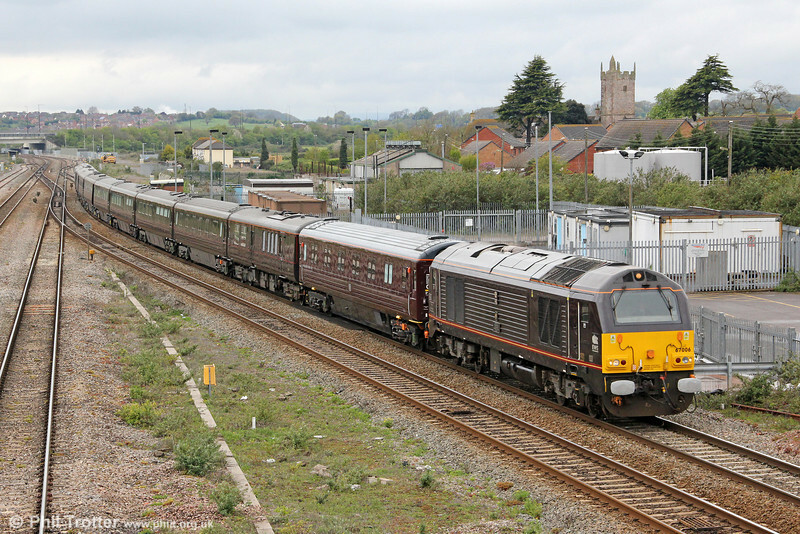 Heading back to Wolverton after the Queen's Diamond Jubilee tour of South Wales, 67006 'Royal Sovereign' heads the Royal Train through Severn Tunnel Junction on 27th April 2012. The consist on this occasion (front to rear) was formed of DB Schenker Company Train sleeper 10546, Royal Household couchette 2920, Royal Household sleeping car 2915, Royal Household dining car and kitchen 2917, Royal Family dining car and kitchen 2916, The Prince of Wales's saloon 2923, The Prince of Wales's sleeping car 2922, The Duke of Edinburgh's lounge, bedroom and bathroom 2904, The Queen's lounge, bedroom and bathroom 2903 and Royal Household couchette, kitchen & brake van 2921. 67026 'Diamond Jubilee' was at the rear.